70% of African-Americans have type O or B blood- the blood types most in demand. 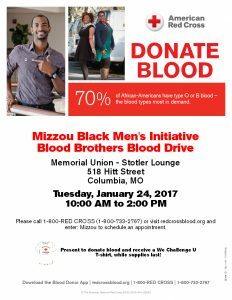 The Mizzou Black Men’s Initiative is hosting their annual Blood Brothers Blood Drive on January 24th from 10am-2pm in Memorial Union- Stotler Lounge. Please call 1-800-RED CROSS (1-800-733-2767) or visit redcrossblood.org and enter: Mizzou to schedule an appointment. Walk-in appointments are also welcome.